1. Always wearing the same gear, bundled up from head to toe including helmet and goggles so no specific features can be noticed. 3. I am not to brave in regular public places asking a stranger to take a family photo and definitely don't see myself stopping someone on the ski hill, asking them to risk frost-bite to their fingers and stop their "epic" ski day to take a photo for us. 4. There are only so many angles to achieve while riding on a chair lift. 5. The amount of photos with a black gloved finger in them are numerous and not that impressive. So, with all that said, I will warn you that you may see many of these photos during this winter and you may think I am just recycling one or two pictures but I assure you they are new and unique shots:-) Last year our ski day was just a fun adventure while this year we are hoping to have a SEASON of skiing. Bring on the snow!! Tom got up for his first day on Friday to check things out and the girls have been BEGGING to go up since the hill opened. So off went today with the truck loaded. The 4 wheel drive was very handy as we saw many cars pulled over having to chain-up. It was a BRISK day on the mountain, topping out at 27 degrees. Far different from our first ski experience HERE last spring when it was in the 50's and we barely needed jackets. But the experience was also much different in the fact that the girls' skiing was SOOO much better. I can't really explain why since there has been no practicing or training sessions in the off-season but it was so much easier to manage. Madison only had 2 falls on her very first run and then was on her feet the rest of the day. She is definitely ready to progress from the Discovery Chairlift (ie - bunny hill) but the next lift is such a huge leap in difficulty I am not sure how we manage that. Here is video of Madison mastering the mountain. Nora also did so much better. Though I will admit that Tom dealt with her the majority of the day. She seems to respond better to him on the slope (in other words she whines much more for me than him:-). I think the total of her falls the whole day was the amount she fell on each run last year. She had much better control of her body and vision for where she was going. Due to the cold, we didn't stay quite as long as last time but we see it as a very succesful first day of the season. I imagine the girls are going to be asking to go every weekend. But maybe we will shoot for once a month and throw in a few lessons along the way. Any guesses where the family is headed tomorrow? A feast for four at the Kimmet house this year. Though with the amount of food we had we could have fed double that. Especially considering that the two youngest family members aren't big fans of most of the food for this meal. Though I have to say, they did much better this year than in years past, so there is hope for them eating a real Thanksgiving meal in their future! Madison was very helpful in the kitchen this year as my Sous Chef. She assisted with the cranberry sauce, homemade rolls and stuffing along with helping with table setting duties. It was fun to work on the meal together. She also was kind enough to venture outside to feed the birds their Thanksgiving meal. We have been keeping them well fed during our cold-spell and have quite the flock depending on us now. Here she is modeling the latest in chef fashion (pj's, robe and apron all together in one ensemble, along with daddy's crocs). We had wonderful dinner conversations and must have been at the table for over an hour chatting and reminiscing. At one point Nora had us all rolling with laughter over her quoting a Geico commercial. Madison had made some lovely, one-of-a-kind name cards for each family member and I added some conversation starters to the back. Here are some of the questions and answers for my memory keeping. We also had a nice discussion on all that we are thankful for and how lucky we are. We moved that into a conversation of really focusing on GIVING this holiday season. I am hoping to putting the emphasis on this over the next month through homemade gifts, charitable donations that the girls actively participate in and I am hoping to find a hands-on volunteer activity that we can participate in as a family. I am brainstorming ways to document these through the season as a way to keep our minds and hearts on what is important instead of what we are getting or doing (though I am sure there will be plenty of that too.....). Sunday afternoon we started getting snow flurries and the girls and I were hoping for a big snow to start the winter off!! Got a little by Monday morning but not enough to make changes to the start of the day. And THEN it all began getting serious later in the morning and I began to regret wishing for the white stuff. Very long story but I can sum it up with saying I got the van stuck on the hill up to our house and Nora had an hour plus bus ride. After 2 hours of stress we finally made it home and got to start enjoying the snow like we had hoped. And I really can't complain about my 2 hours of stress since I know many people whose 30 minute commutes home lasted over 9 hours sitting on I-5 last night. I can't even imagine. I think the highlight of the night was eating dinner with candlelight so we can get a better view of the blizzard conditions outside (well, for Seattle it seemed like a blizzard!). Then this morning we woke to a true winter wonderland, complete with sub 20 degree temps! I was able to keep the girls indoors until 9:00 and then there was no containing the excitement any longer!! They had a great time in the backyard and then sledding on the neighbor's hill. They lasted a good 2 hours before the cold finally got the best of them (and me!). Micah LOVES the snow!! She acts like a puppy when she gets out in it. We are looking forward to a fun winter and gearing up to enjoy it all!! We had a great family get away to Great Wolf Lodge! Of course the water park was the top highlight! The girls LOVED the wave pool. I was truely amazed how comfortable they were swimming around in the crazy waves. Nora especially got tossed all around and under the water and always came up with a huge smile on her face. Thankfully, Nora cleared the height requirement by about 1/2 an inch so we were able to go on the fun big slides as a family. Again, no fear from the kids but a bit from mom. Once on the Howling Tornado was plenty for me, while Tom and Madison went on it a number of times. Nora wanted to make sure we will come back when she can go on that slide, though the way she grows it will be quite awhile! The girls loved their own special little room complete with bunk beds and a tv. They named all the animals painted on the walls, of course. Story time at the end of the evening was a great way to prepare for bed. They were so exhausted by this point they could barely walk back to the room. We gave the arcade an attempt and had a bit of fun. I think the girls mostly liked collecting the tickets for prizes. MagicQuest was a ton of fun. Overall, it was a great trip with fun for everyone! I am sure we will be going back. So happy we went mid-week to avoid the crowds and lines. It made the experience that much better. Today on Becky Higgins' blog she wrote about her family's Gratitude Family Project. You can see it here. I thought I would share the project that we started on Monday. Last week I was avoiding housework recalling memories from the past and discovered my Daily Thanks project from 2 years ago. This was my first attempt at a "Photo a Day" project and I took one picture each day of November for what I was thankful for. I still love going back to look at these photos. It captures a different perspective of my life, not just the faces and places but the little details. So this year I wanted to do something similar but have it more immediately visible and something the whole family could participate in. I love having banners on our mantle so decided to create a BE THANKFUL banner. I used all my leftover pieces from the 2009 Project 365 kit to make the bigger pieces to link the ribbons together. I covered mini-clothes pins with the paper scraps and we are using the journaling cards for our thoughts. Love how this project captures adorable kindergarten writing and newly discovered third grade writing. No big "rules" or system for this project. I am keeping the box of journaling cards and markers, pens and pencils on our dining room table. This is a good reminder at dinner to discuss our thanks and see who is planning to add to the banner that night. 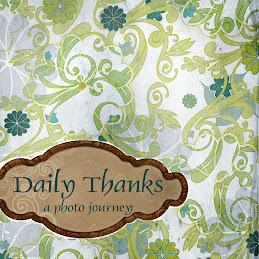 We can add photos, drawings, writing and more to our banner to represent what we are thankful for. Initially I thought we would take turns to add one card each day. But the girls were really excited about it and I didn't want "controlling craft mommy" to raise her evil head saying "NO it is not your turn to add a Thankful card tonight. You can not be thankful until your assigned day!" I really want this to be not about the "cute quotient" of the craft but about the meaning behind it. Madison added her own banner to go above mine and at first I cringed because it was coordinated all together. But now I love her addition and am excited to see how our banner grows and evolves over the month. At the end of the month I plan to find a way to do a scrapbook layout with the cards.